It’s been a quiet two weeks around here, but I have a good excuse…Adam and I have been in Costa Rica! With no kids! And other adults! It was an amazing trip and just the break we needed. 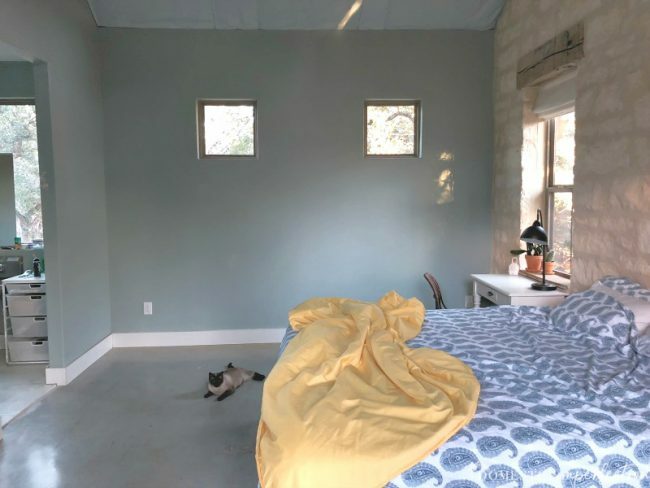 I’ll write up a post about it when I’m finished with this bedroom makeover (so two weeks…I have a deadline) and share all the details. 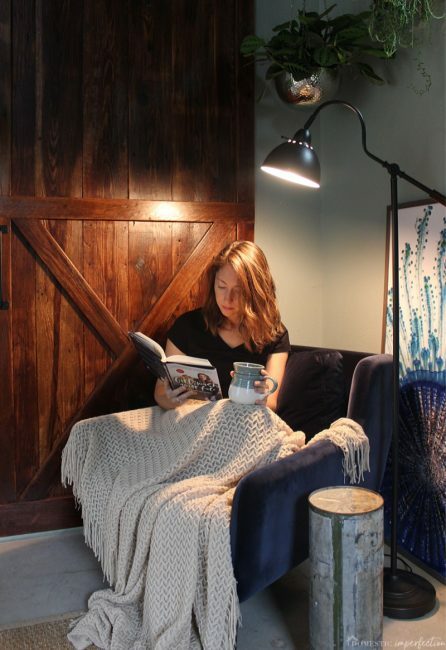 Speaking of the bedroom makeover, we’ve finished a small section of it…the reading nook! I love it so much, I just sit in bed at night and smile at it until I fall asleep. We’ve been in our house for over two years now, but since we’re still building it I haven’t done much in the way of decor. It’s nice to move away from DIY for a moment a just decorate. So here is the eventual bedroom goal, which was made with Modsy. 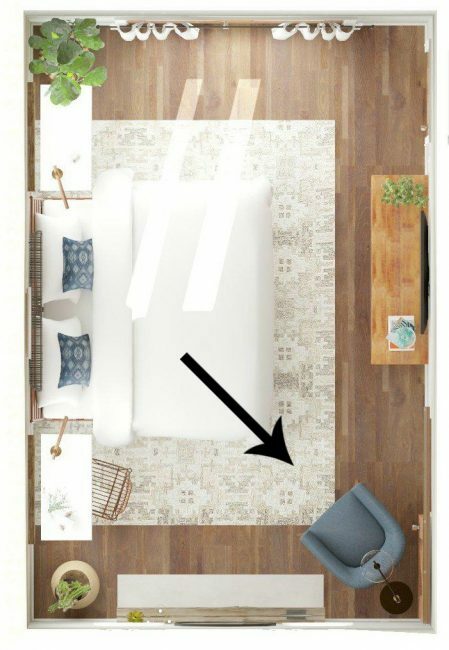 You can see the reading nook area in the picture below. Here is an old before picture of the area…it was very empty and unimpressive. And here is a blurry panoramic shot to give you a better feel for the room. 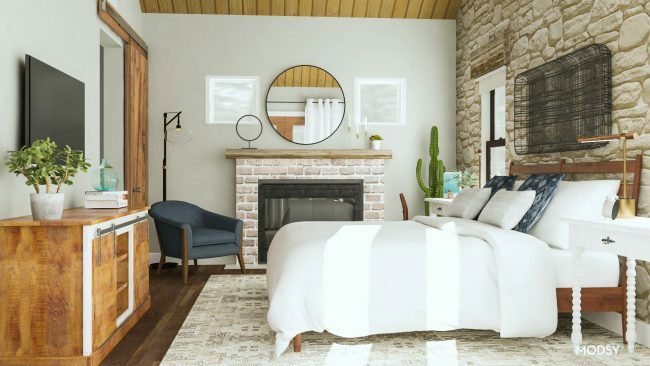 The first step in making our bedroom look like the goal photo was to trim out the bathroom entry and add a sliding barn door. 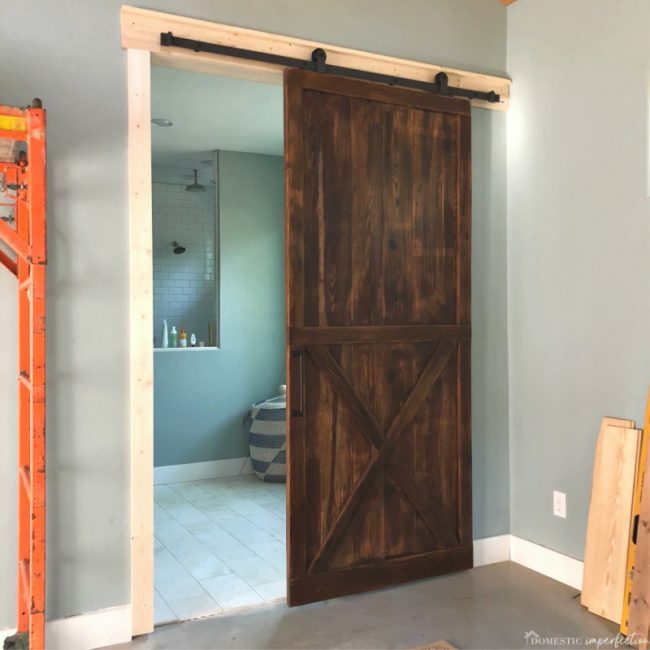 The day that door went up was a big day…..that was the day that I used the bathroom and closed the door behind me. Dreams really do come true. 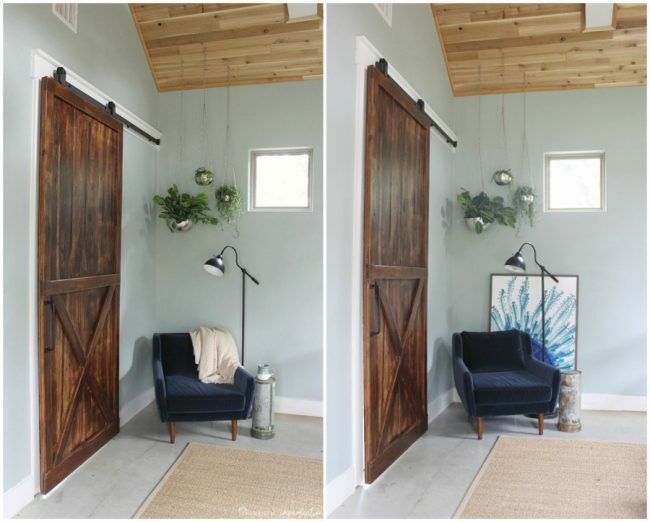 The actual barn door was a DIY, just not ours. 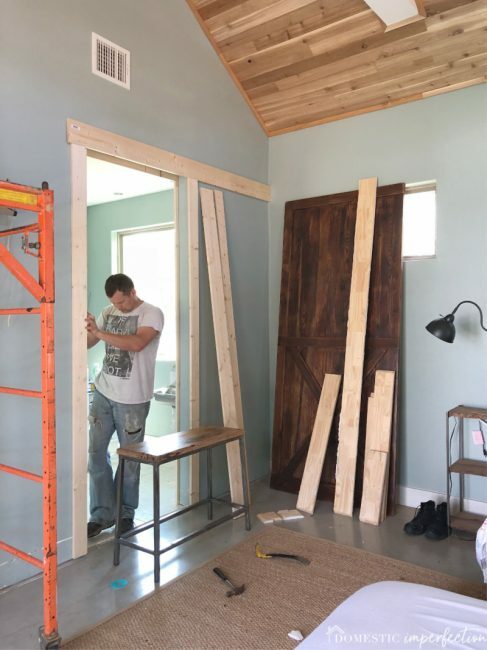 A friend offered to build us something as a thank you for Adam helping him with his house, and this door is what we picked. It’s made of old reclaimed wood and is insanely heavy. I love it. The design plan only called for a chair and a floor lamp in this corner, but I kept on adding stuff until it felt right. One day we will add a fireplace to this wall and the extra stuff in this corner will be overkill, but for now it’s perfect. Alright, let’s talk details, starting with that awesome velvet chair. 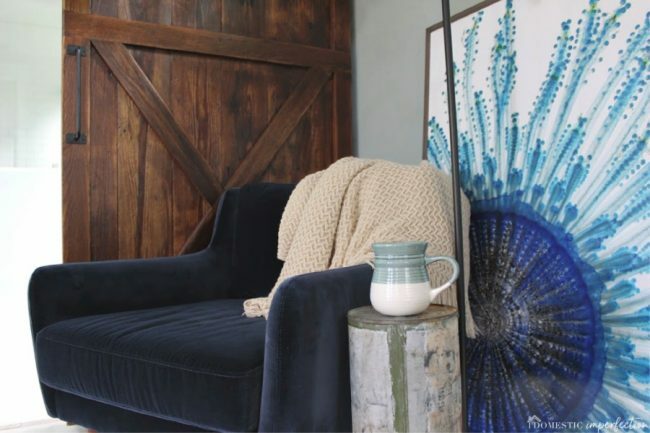 I have been wanting a piece of velvet furniture for a while now, and I was really excited when Article asked to partner with me again for this room. They have a ton of gorgeous velvet furniture in a rainbow of colors, and the bedroom seemed like the perfect, low-impact place to test out velvet. It’s comfortable. Firmer on the seat and soft on the back cushion. It’s well made out of quality materials. Even though the legs look a little questionable, I can assure you they aren’t going anywhere. Everything sticks to it (lint, pet hair, etc). Everything comes off easily with a lint roller, but you will definitely going to invest in a lint roller or two. 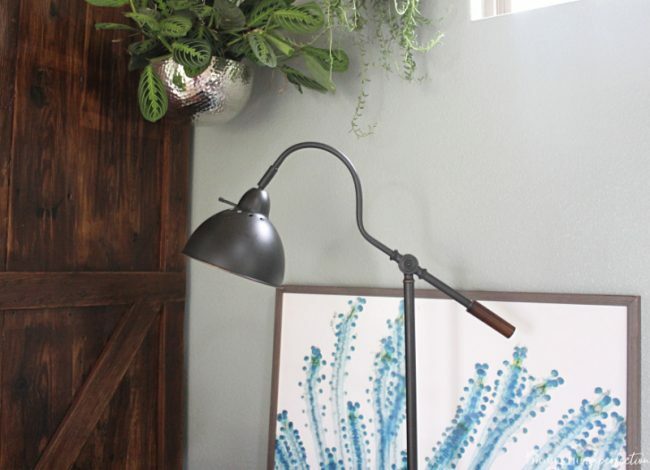 The next item up is the floor lamp. Would you believe me if I told you it was only $40 from Walmart? I’ve owned the matching table lamps for over a year and really like them, so when it came time to get a floor lamp this one was a no-brainer. 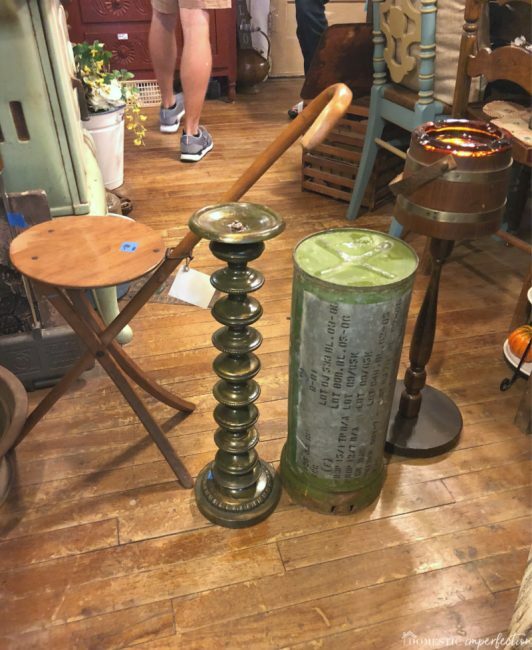 The weird little side table is a vintage find. I was on a mission to find one last week, here are the options I collected at the local antique store. 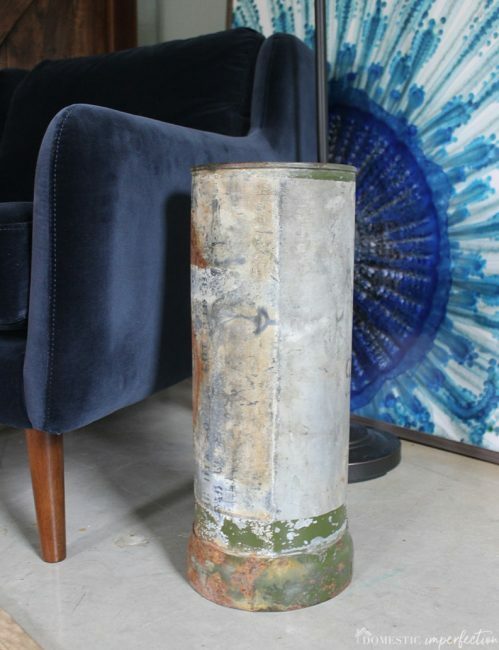 I liked them all, and the one I picked is actually a large artillery shell container. If you turn it one way it’s a tiny little table, turn it the other way it works as storage or a planter. They had two and I bought them both, because old rusty metal and chipped green paint is likely something I will never get tired of. The opposite of rusty old metal are these hanging planters. 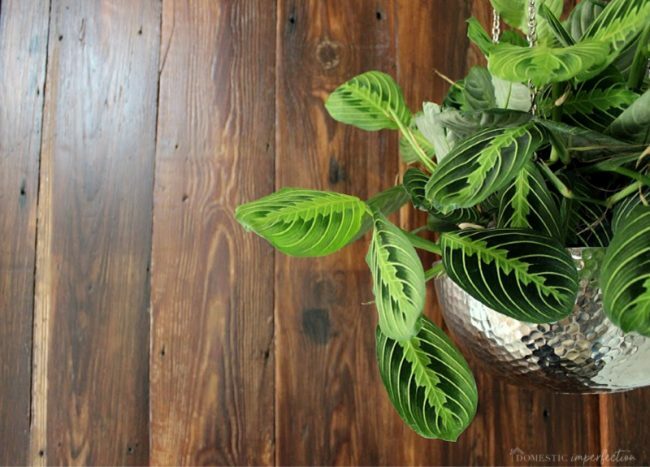 The hammered metal is really pretty, it adds lots of texture and shine without being over the top. 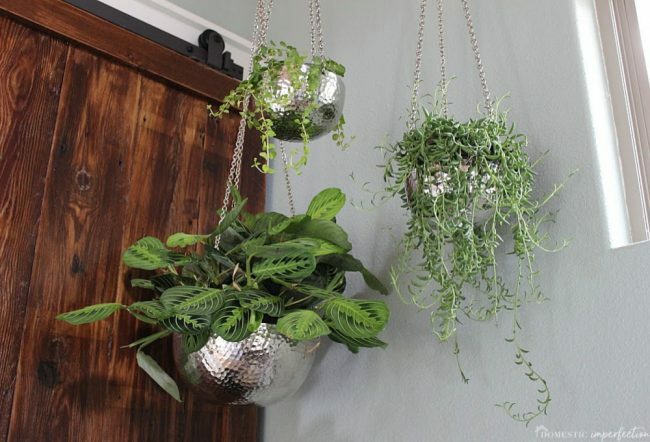 These are also from Article and come in silver, gold, and copper and in small and large hanging planters, a regular planter pot, a bowl, and a platter. I’m a firm believer that every space needs a plant or two in it. If you have an area of your house that needs something, but you’re not sure what. Add a plant. Need home decor but you’re kinda broke? Plant. Scared of plants and have a black thumb? Fake plant. The jellyfish print is something I’ve had for a few years. I bought it when we lived in our previous house, and I it’s been floating around since we moved in because I can’t find a good spot for it. One downside living in a very open concept home is that there are no walls to hang things on. I like it tucked in this corner though…it looked a little empty without it. 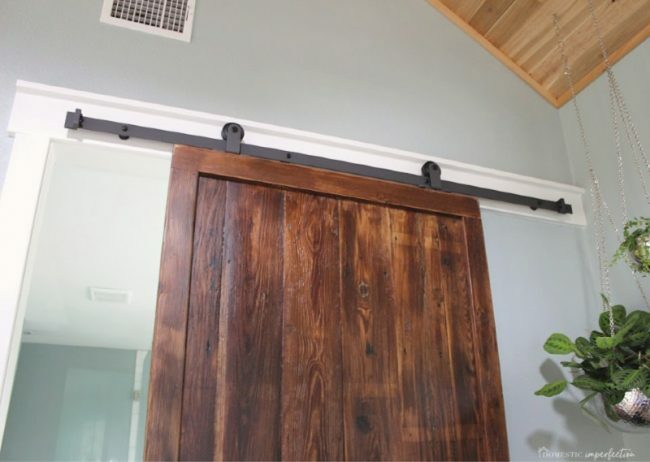 I almost forgot to mention the barn door hardware, which is from Amazon. It’s an extremely reasonable price, we used the same set in the living room and it works really well…there’s no reason to spend more than this. 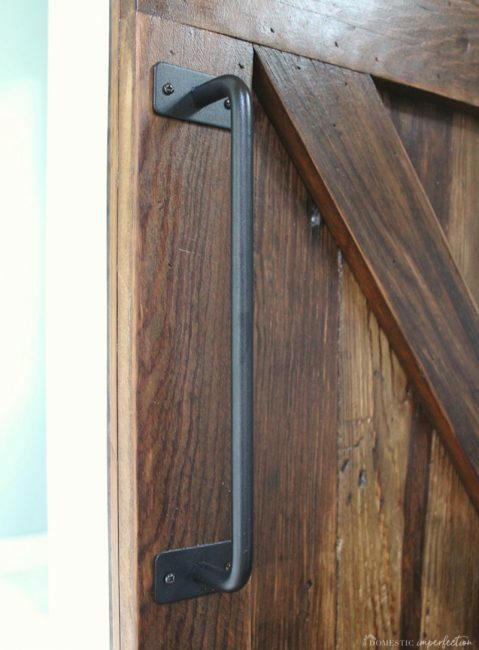 Plus I love that its top mount, I like the look much better than the ones that mount to the front of the door. The handle is also from Amazon, and for the wallet-emptying price of $12. 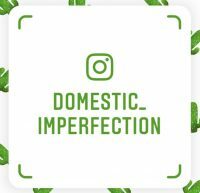 And that covers everything used in this little makover, you can find a full source list at the bottom of this post. Also, I can’t leave without showing you a few outtakes. Here’s my bra-wearing toddler and my “take a picture of me” preschooler making things as difficult and hilarious as possible. 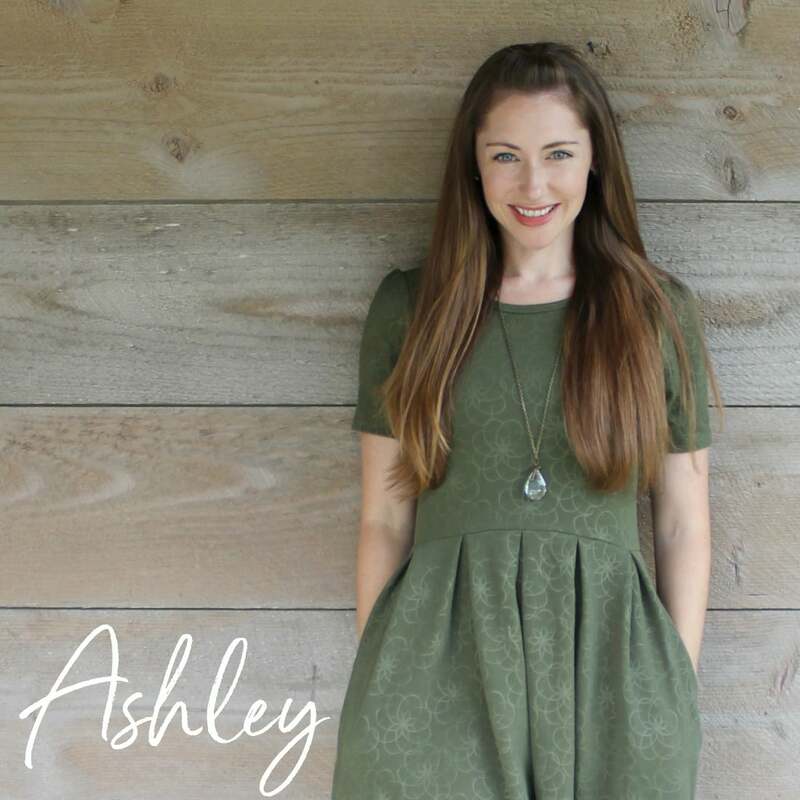 *The Article items used in this post were provided to me free of charge, in exchange for using them in the makeover and featuring them on the blog. Article is one of the best companies I have ever worked with, they are laid back, reliable, and give me complete creative control. Also, their furniture is fantastic. I’m only about halfway through the book so far, but I’m really enjoying it! I’ll have to check out her podcast! 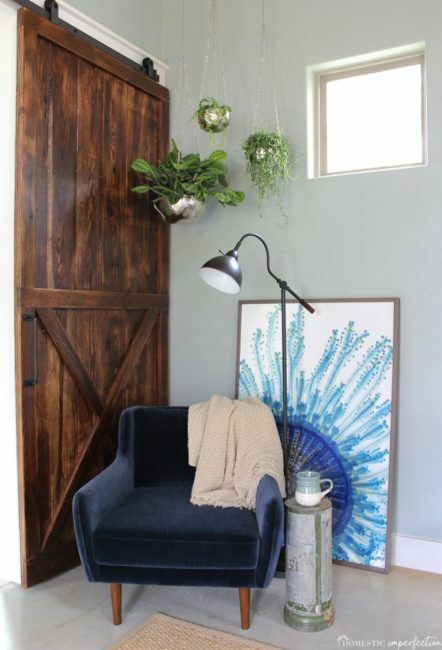 The nook is just beautiful; the blue velvet chair is a lovely addition and so perfectly cozy for some mama time (when you can snag it!). The bra-toting kiddo pictures are also priceless. What is the attraction of our “over-shoulder-boulder-holders?” I have recent pictures of my toddler doing the same thing! On a completely different note, loved the Dumb and Dumber print choice. 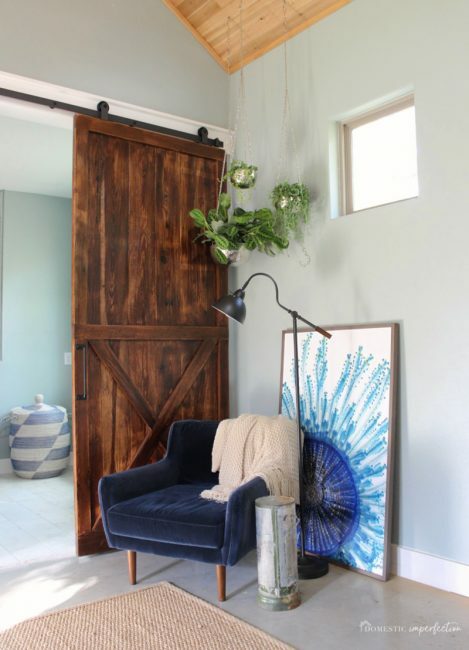 Beautiful nook!And I love the wall color. haha the toddler pics are the best of the bunch!! 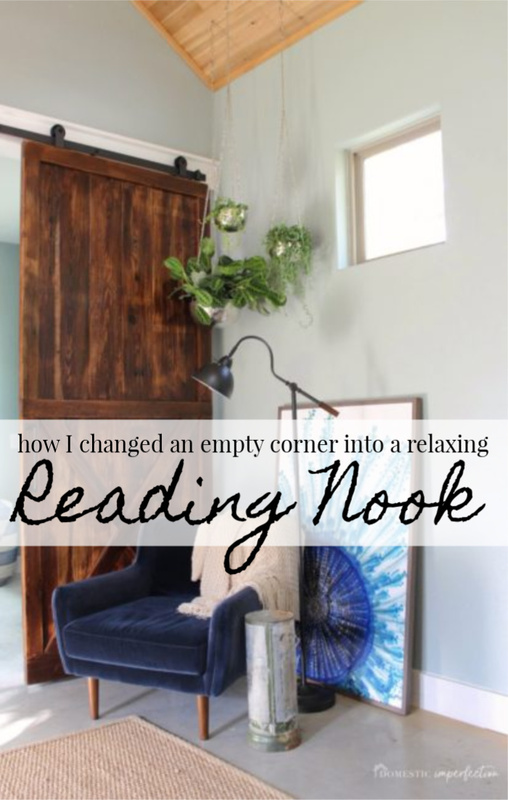 Look the nook too though! what are the types of plants you used? The small one is called a Creeping Jenny and the big one is a Maranta (prayer plant). No idea what the middle one is. I got them all at Home Depot! What a fantastic & lovely article this is! Really great & lovely article. Keep this up. Thanks for sharing.